Home Dell's Friends	Circa Classics Distinctive Consignments-A New Favorite! Happy Monday, Friends! I hope you had a lovely weekend. And for my local friends, I wanted to share a fun new consignment store I found last week. It’s called Circa Classics Distinctive Consignments. And what a great shop! I’ve lived in Doylestown for 15 years now and passed by this shop dozens of times and thought about stopping in because it was such a cute shop. But, alas I never found time. Until I was desperately shopping for an outfit and accessories for my son’s upcoming wedding. 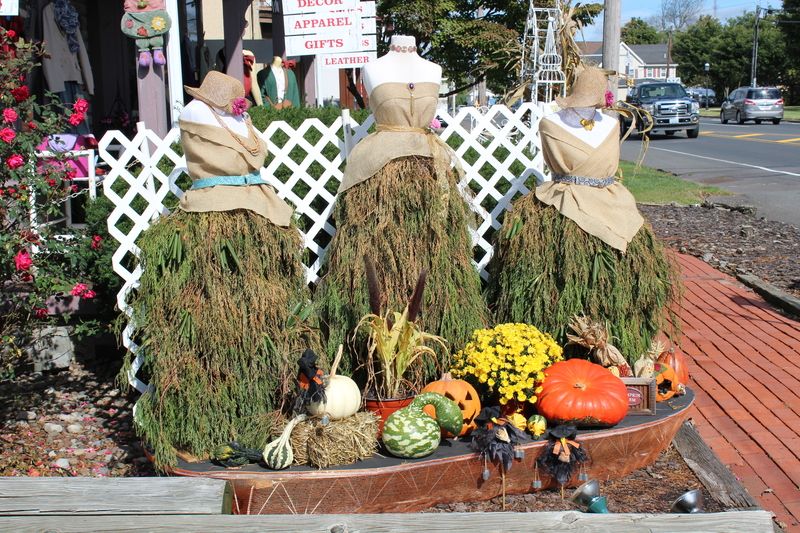 So, last week, while passing by, this adorable fall display lured me in! So, I tried on a few things but nothing really caught my eye. Except I spotted a glass case full of vintage jewelry and brooches. (Which I LOVE.) After much discussion and pondering with the store owner (who was delightful) I bought two beautiful brooches. I love them so much I want to wear them with everything! They will definitely make an appearance at the wedding festivities. I’m not sure which one I love more. They are both so pretty! I think they are both from the 1950’s. I don’t know if consignment or thrift stores are your thing but I love to shop them. The prices are always amazing and you never know what you’ll find. Usually you don’t know you need something until the moment you spot it. Right? We are so fortunate in Bucks County we have so many great ones to choose from. Good Stuff, Circa Classics, Pinwheel, and Nova just to name a few. If you are interested in checking out this store in particular you can go to their website www.circa-classics.com. This boutique sells high end purses such as Louis Vuitton and also has a rent-a-bag program in case you need a sequin covered hand bag for a special occasion. Also, if your teenage girl loves shopping, consignment stores are a great cost saving option. I don’t have daughters, but I’ve heard from my friends and family about how much they love clothes. So consignment stores could be a great option. And a great opportunity for Mother/Daughter bonding and shopping.